Bet DeGale to win by any method at -137 with 888Sport. Bet Eubank by decision at +240 with Karamba. 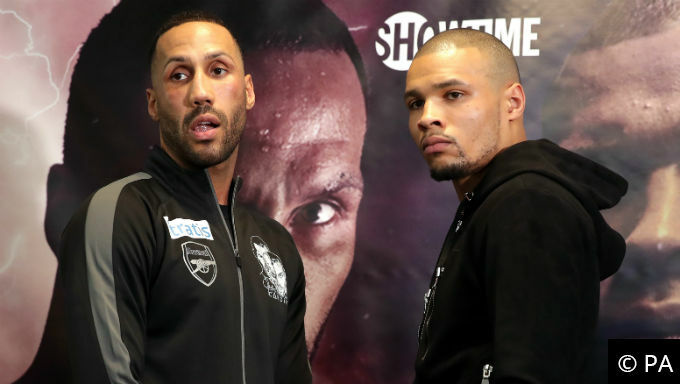 In an all British battle of super middleweights, James DeGale faces Chris Eubank Jr. on Saturday, Feb. 23, at the O2 Arena in London. The 33-year-old DeGale is a former titleholder and Eubank, 29, is a former title challenger. Both are ranked among the top-10 fighters in the 168-pound division by The Ring. The bout will be televised live in the U.S. by Showtime beginning at 3:45 pm ET. Boxing bookmakers tab the younger Eubank as the slight favorite at -137 with DeGale, a more accomplished but older fighter, following at +120. Here’s how fans of boxing betting should approach the fight. Both DeGale (25-2-1, 15 KOs) and Eubank (27-2, 21 KOs) are similar fighters in that both have been relevant contenders with legitimate promotional money backing them, but neither has ever really achieved becoming a truly elite super middleweight. DeGale has accomplished the most with his talents. While not possessing the athleticism Eubank has, the southpaw is a skilled boxer who knows how to use his hands to land punches with precision. A two-time IBF titleholder, DeGale struggles enough on defense and with overall footwork to leave himself vulnerable to being outworked. While he possesses high-level boxing skills, he’s not quite elite enough at it in comparison to other elites. Eubank is a tad different, though the end result has been the same. Eubank is a fast, athletic competitor who seems to lack precise skill. He’s aggressive on offense, but he overpunches at times and allows his opponent the chance to counter. Against lower-level opposition, Eubank has the appearance of world champion-caliber fighter. When not presented with an opponent who can neutralize his particular set of skills, he wins the fight and looks good doing it. DeGale-Eubank will boil down to how much Eubank has worked on his flaws in training and whether DeGale has one more big performance left. This fight has the appearance of a situation where a bettor could back either fighter, watch the event live and feel reasonably secure in his pick before the judges read their scorecards. The most likely outcome of the fight is a back-and-forth battle with close rounds. Some people will like DeGale’s clean punches and movement. Others will prefer Eubank’s aggressiveness and overall higher volume of punches. Boxing judges are not infallible. While they strive for objectiveness, it’s hard to believe they don’t head into fights like this at least subconsciously leaning one way or the other. Because of it, and the age difference, it’s best to back Eubank by any method at -137 with 888Sport. He’s a younger fighter who has appeared in the past to be on his way to bigger things. Moreover, being a direct descendant of a popular British fighter certainly won’t hurt his case. Besides, fighters usually start slipping around age 33 and only the best boxers can slow or stop their demise by using other tactics. DeGale has enjoyed a solid career, but his fade from glory probably won’t be atypical. It’s hard to predict a stoppage. The only way that happens is if DeGale has suddenly fallen off a cliff, and there’s nothing to reasonably suggest that yet. Backing Eubank by decision seems a solid play at +240 with Karamba. It’s uncommon for bookies to post the Fight to Go the Distance at -182 while still offering the favorite by decision with such strong returns. Whatever you do, back Eubank to win the fight or focus on bets the don’t predict the winner such as yes on the Fight to Go the Distance.